Loděnice is mentioned in the anecdote about Karderaz who expertly sleept with his top hat as a pillow. Loděnice is a village by Beroun west of Prague. Although there are several place thus named in the Bohemia, this is the likeliest one as the author knew the area well. He visited first in 1913 with Zdeněk Matěj Kuděj and again with Josef Lada in 1914. [4.3] Vyspat se na cylindru, to doved jenom nějakej pan Karderaz v Loděnici. Turze is part of the conversation between major Derwota and general Fink von Finkenstein. The major pointed out that Švejk was caught 150 km behind the front which was running along the line Sokal - Turze - Kozłów. Turze is the Polish name of the village Тур'я (Turia) in the Busk region of western Ukraine. [4.3] Major otevřel si stůl, vytáhl mapu a zamyslel se nad tím, že Felštýn je 40 kilometrů jihovýchodně od Přemyšlu, takže jevila se zde hrozná záhada, jak přišel pěšák Švejk k ruské uniformě v místech vzdálených přes sto padesát kilometrů od fronty, když posice táhnou se v linii Sokal-Turze-Kozlów. Kozłów is part of the conversation between major Derwota and general Fink von Finkenstein. The major pointed out that Švejk was caught 150 km behind the front which was running along the line Sokal - Turze - Kozłów. Kozłów is the Polish name of the small town Козлів (Kozliv) in the Ternopil oblast in Ukraine. Wojutycze (now Воютичі) was the brigade headquarters and it was here Švejk was escorted to after he barely avoided execution in Przemyśl. Chief of staff was colonel Gerbich who struggled with his painful toe and corresponding outbursts of rage. Here we also have a reunion with both Lieutenant Dub and Cadet Biegler. Dub has had an accident while Švejk was away, he fell from his horse when he tried to show off his equestrian skills. Biegler has now been released from the cholera ward in Tarnów and has made his way by train, spending most of the time in the toilets due to the loose stomach he has suffered from all the way from Budapest. Wojutycze is the Polish name of the village Воютичі (Voyutychi) in the Lviv oblast in Ukraine. Note that the author calls it Wojalycze, but it can be safely assumed that he refers to Wojutycze. Wojutycze is located on the railway line between Sambor and Chyrów and the 12th march battalion of IR91 with Jaroslav Hašek travelled past it around 4 July 1915. Any location of the staff of 17th infantry brigade (to which IR91 belonged) here can be ruled out both before and after the author joined the front. On 4 July the brigade was located further east by Lipowce and not even when IR91 marched past the town on 15 May was there any mention of brigade staff being located here. [4.3] Polák mu na to neodpovídal a nakonec celá eskorta byla v hlubokém mlčení, jako by jela na pohřeb a přemýšlela s pietou na nebožtíka. Tak se blížili ku štábu brigády do Wojalyzce. Mezitím se u štábu brigády zběhly jisté velice podstatné změny. Řízením štábu brigády byl pověřen plukovník Gerbich. Sądowa Wisznia is mentioned in connection with Dub's riding accident. Sądowa Wisznia is the Polish name of the town Судова Вишня (Sudova Vyshnia) in the Lviv oblast in western Ukraine. It is situated right on the Polish border. [4.3] Za těch několik dní od pochodu Sanok-Sambor poručík Dub prodělal opět jedno dobrodružství. Za Felštýnem potkala totiž 11. pochodová setnina transport koní, které vedli k dragounskému pluku do Sadowe-Wisznie. Lwów is just about mentioned as Švejk is issued a military ticket from Wojalycze (Wojutycze) to Żółtańce via Lwów. There is no description of any stay here. Lwów had by then already been mentioned a few times the novel. Based on historical facts the soldier must have passed through it some time after 22 June 1915 because this was the day the Central Powers reconquered the city. Lwów is the Polish name of Львів (Lviv), the main city in western Ukraine. It was until 1918 part of Austria-Hungary and the capital of Galicia. At the time the majority of the population were Polish, but there were also sizeable groups of Ukrainians, Germans and Jews. The Russians army occupied Lwów on 3 September 1914, but the city was back on Austrian hands on 22 June the following year. The city suffered little damaged during the war because on both occasions the defenders abandoned the city. Żółtańce (now Жовтанці) is the station Švejk arrives at after he has been sent back to his march company. He has a short stay here, asking for the whereabouts of the 11th march company, before walking to join them at Klimontów. The author describes the situation in the town in detail, that the front is so close that artillery can be heard and smoke from burning villages can be seen. He also describes how well off the German army is with respect to supplies; they even get beer for lunch. Żółtańce is the Polish name of Жовтанці (Zhovtantsi), a small town of 3,500 inhabitants north east of Lwów. Three battalions of IR91 (including Jaroslav Hašek) arrived at Żółtańce on 16 July 1915. It was a mere two hour break on the march from Gologory to the front by Sokal. It is therefore unlikely that the author visited the town in such a short time, which suggests that the inspiration for this part of the plot hails from elsewhere. The station mentioned in the novel must have been Żółtańce-Kłodno, a few km north-east of Żółtańce. Today the station is called Kolodno. Evžen Topinka:: Želežnicní trat ze Lvova do Sapizanky byla postavena v r. 1910 pak dále do Vladimira Volynskeho (přes Krystynopol - ted Červonohrad a Sokal) v 1914. (Hrankin , Lazecko, Somockin, Sramko. Lvivska zaliznycja. Istorija i sucasnist). Přimo v Žovtancich želežnicní stanice neni, je vedle a jmenuje se Kolodno. Problém je v tom, že Hasek ji omylem jmenuje Klimontów. [4.3] Ve stanici Zóltance bylo shromáždění celého batalionu hejtmana Ságnera až na nachhut ze 14. kumpanie, který se někde ztratil, když obcházeli Lvov. Při vstupu do městečka Švejk ocitl se úplně v novém prostředí, neboť zde již bylo pozorovat ze všeobecného ruchu, že není tak příliš daleko na posici, kde se to řeže. Všude leželo kolem dělostřelectvo a vozatajstvo, z každého domu vystupovali vojáci nejrůznějších pluků, mezi těmi jako elita chodili říšští Němci a aristokraticky rozdávali Rakušanům cigarety ze svých hojných zásob. U říšskoněmeckých kuchyní na náměstí byly dokonce sudy s pivem, kde se vojákům točilo pivo do odměrek k obědu a k večeři, kolem kterých sudů ploužili se jako mlsné kočky zanedbaní rakouští vojáci s nabobtnalými břichy od špinavého odvaru slazené cikorky. The railway station in the inter-war period. Kamionka Strumiłowa is mentioned in the narrative from Zóltance. It is said that the Russians are bombarding the town from Grabowa. Kamionka Strumiłowa is the former Polish name of Кам'янка-Бузька (Kamianka-Buzka), a town in the Lviv oblast in the Ukraine. The town is situated on the river Bug, 40 km north of Lviv. Jaroslav Hašek's IR91 was stationed in the area from 17 July to 21 July 1915, preparing to cross the Bug. They never carried it out as they were redirected to Sokal due to the critical situation at that section of the front. This is a route Švejk presumably also would have taken. [4.3] Slyšet bylo zřetelně dunění děl. Tu zas křičeli, že Rusové bombardují z Grabové Kamionku Strumilowu a že se bojuje podél celého Bugu, a vojáci že zadržují běžence, kteří se už chtěli vrátit za Bug opět do svých domovů. Grabowa is mentioned in the narrative from Zóltance. The Russians are bombarding Kamionka Strumiłowa from Grabowa. Grabowa is the Polish name of Грабова (Hrabova) in the Lviv oblast in the Ukraine. The village, which at the latest count had 402 inhabitants, is located 24 km east of Kamianka-Buzka, just north of Busk. Busk is mentioned in the narrative from Zóltance. Smoke from burning towns was observed and it was said that Busk was one of them. Busk (Буськ) is a town in the Lviv oblast of the Ukraine, located on the river Bug. It has well above 2,000 inhabitants. Around mid-July 1915 there was fierce fighting along the Bug, events which are reported in official communiques from Vienna. To the right is a report from Národní politika on 13 July. [4.3] Skupiny pejzatých židů v dlouhých kaftanech ukazovaly si na mraky kouře na západě, šermovaly rukama. Křičelo se všude, že to hoří na řece Bugu Uciszków, Busk a Derewiany,. Uciszków is mentioned in the narrative from Zóltance. Smoke from burning towns was observed and it was said that Uciszków was one of them. Uciszków is the Polish name of the village Утішків (Utishkiv) in the Lviv oblast in the Ukraine. It is located on the river Bug, in the Busk raion. At the last census it had 894 inhabitants (2001). 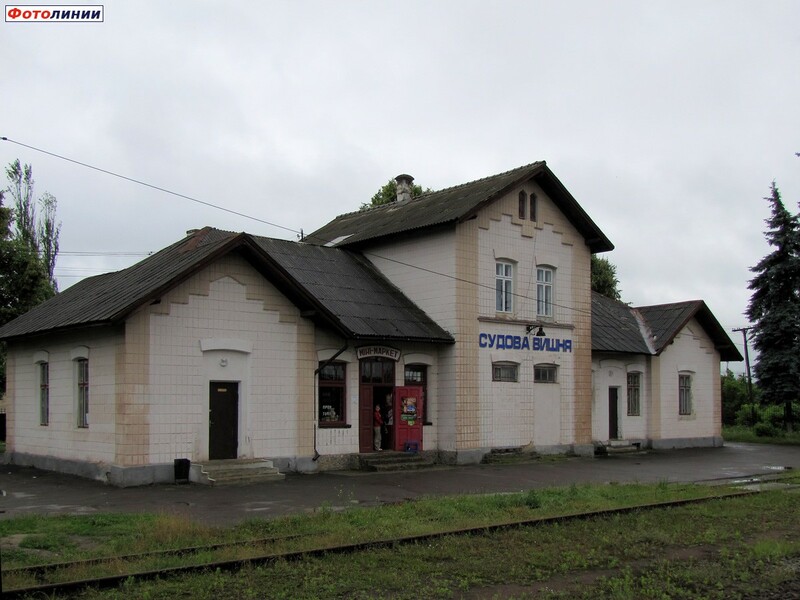 The village has a railway station, on the line Lviv-Zdolbuniv. Derewlany is mentioned in the narrative from Zóltance. Smoke from burning towns was observed and it was said that Derewlany was one of them. Derewlany is the Polish name of Деревляни (Derevliany) in the Lviv oblast in the Ukraine. The village is located on the river Bug and had 461 inhabitants at the latest census (2011). Around mid-July 1915 there were fierce battles along the Bug, just as the author observes. At the time he had just arrived at the front (11 July), and his regiment and the complete 9th Infantrydivision were transferred northwards west of the Bug. From 23 July onwards the division was engaged in the battle of Sokal, after having replaced two German regiments. Am Bug, nordwestlich Busk, haben unsere Truppen bei Derewlany einen russischen Stützpunkt genommen. [4.3] Skupiny pejzatých židů v dlouhých kaftanech ukazovaly si na mraky kouře na západě, šermovaly rukama. Křičelo se všude, že to hoří na řece Bugu Uciszków, Busk a Derewiany. Adige is part of Švejk's dark thoughts about the homosexual colonel Habermaier. Adige is a river in Northern Italy, flowing through cities like Bolzano, Trento and Verona. It's source is on the border with Austria and the river flows into the Adriatic. [4.3] Švejk pokračoval na své cestě do vesnice, a přemýšleje o plukovníkovi, dospěl k tomu úsudku, že před dvanácti lety byl v Tridentu nějaký plukovník Habermaier, který se také tak laskavě choval k vojákům, a nakonec vyšlo najevo, že je homosexuelní, když chtěl v lázních u Adiže zprznit jednoho kadetaspiranta, vyhrožuje mu „dienstreglamá“. Klimontów is the final stop in the novel. The 11th march company is billeted in the local school after a brawl with Bavarian soldiers on the town square in Żółtańce. The staff reside in the vicarage of the executed Greek-Catholic priest, and a meal is being prepared after a pig has been slaughtered. Dub and Biegler rejoin the company after recovering from their respective misfortunes. Lieutenant Dub utters the final words of the novel, as idiotic as ever, in a conversation with Captain Ságner. Klimontów is almost certainly a mix-up with Колодно (Kolodno), a village 3 km east of Żółtańce, on the eastern side of the railway line Lviv - Sokal. It is often referred to as Kłodno Wielkie, today Велике Колодно. The railway station at Kłodno is surely where Švejk arrived, before walking to Żółtańce where he was told that his regiment was billeted in Kłodno. The greek-catholic church was located where the russian-orthodox church is today. The 91st regiment marched past here on July 16 1915, but they had no overnight stay. It is therefore likely that the author got inspiration for the plot from somewhere else. Nor does it seem logical that there was a large school here. It is unclear why Hašek called the village Klimontów but it should be noted that the author was gravely ill when he dictated these last passages of the novel. Bochnia Zamurowana is mentioned in the description of the execution of the Greek-Catholic priest in Klimontów. The priest had been at a spa in Bochnia Zamurowana when the alleged betrayal of Austria had taken place. Bochnia Zamurowana is not identifyable on any map, but we must assume that the author refers to a spa around Bochnia, at the river Raba between Kraków and Tarnów. There is a village called Lipnica Murowana in the area, there might be a connection here. [4.3] Nebylo to sice pravda, poněvadž v té době obviněný vůbec nebyl v místě přítomen, jsa na léčení kvůli svým žlučovým kamínkům v malých lázních nedotčených válkou, v Bochnie Zamurowane. Jihlava is part of an anecdote by Švejk. Jihlava is a city in the Vysočina region in Moravia. Until 1945 it was a German-speaking enclave. Gustav Mahler spend most of his youth here. [4.3] Za to dostal jednou od nějakýho slušnýho pána z Jihlavy takovou přes hubu, že kavárník ráno, když vymetli ty zuby, zavolal svou dcerušku, která chodila do pátý vobecný školy, a zeptal se jí, kolik má dospělý člověk v hubě zubů. Kundratice is part of the anecdote about Mr Hauber who got stabbed here by mistake when he was on a sunday trip. Kundratice is the name of many Czech locations but here the author surely means Kunratice in Prague 4. The village was until 1990 a separate administrative entity. [4.3] Takovej člověk musí bejt skromnej a trpělivej. V Nuslích je nějakej pan Hauber, toho jednou v neděli v Kundraticích na silnici píchli omylem nožem, když šel z výletu od Bartůňkovýho mlejna. Solingen is part of the anecdote about Mr Hauber from Nusle who been on a Sunday trip to Kundratice when he by mistake got stabbed with a knife made from Solingen steel. Solingen is a city in Nordrhein-Westphalen with around 160,000 inhabitants. The city has from medieval times been known for the production of knives, even today 90 per cent av all German knives are made in Solingen. [4.3] A von s tím nožem v zádech přišel až domů, a když mu žena svlíkala kabát, tak mu ho pěkně vytáhla ze zad a dopoledne už s tím nožem rozkrajovala maso na guláš, poněvadž byl ze solingenský vocele a pěkně nabroušenej a voni měli doma všechny nože pilkovatý a tupý. Petrograd is mentioned by Švejk when he asserts that waging war just to get to the old borders of Galicia has no purpose. One should at least get to Moscow and Petrograd. Petrograd was from 1914 to 1924 the name of current Санкт-Петербург (Saint Petersburg), Russias seconds largest city and capital of the country from 1713 to 1918. The city has 4,6 million inhabitants, 6 million with suburbs included. The city played a pivotal role in the revolutions of March and November 1917 which ultimately led to Russia pulling out of the war. The revolutions also had far-reaching consequences for Jaroslav Hašek and would have had so also for Švejk if the novel had been completed. [4.3] „To by nestálo za to ani válčit,“ řekl důrazně Švejk. „Když vojna, tak vojna. Já rozhodně dřív vo míru mluvit nebudu, dokuď nebudeme v Moskvě a v Petrohradě. Přeci to nestojí za to, když je světová vojna, prdelkovat se jenom kolem hranic. Vezměme si například Švejdy, za tý třicetiletý vojny. Jedouchov is mentioned by Švejk in connection with armies that venture far from their homeland. The Prussians got all the way here and even to Amerika. Jedouchov is a village in the Vysočina region 5 km from Lipnice nad Sázavou. It can safely be assumed that Jaroslav Hašek has been there. Stockholm is mentioned by Švejk when he has one of his last encounters with Dub. The latter threatened to get Svejk stuffed. Svejk dryly observed that some King of Sweden had been killed in a battle, and that both the king and his horse had been brought back to Sweden, had been stuffed, and finally exhibited in a Stockholm museum. Stockholm is the capital and largest city of Sweden, and one of the largest cities in Northern Europe. The city has around 800,000 inhabitants and 1,3 million if the whole urban area is counted. Stockholm has one of the oldest Švejk restaurants in the world, Krogen Soldaten Svejk in Södermalm. It serves an exclusive range of Czech draught beers, no bottles or non-Czech beer are on sale! Bohdalec is mentioned by Švejk in an anecdote he nevers gets to complete as Marek interrupts him, after Švejk in his turn has interrupted Jurajda. Bohdalec is a small area in Prague which is administratively part of Praha 10. The hill in question is located on the border between Vršovice and Michle.